The IBM Tivoli Change and Configuration Management Database (CCMDB) is one of the key components of the IBM Service Management (ISM) strategy. It is the foundation for automating and supporting Change and Configuration Management processes as described by the Information Technology Infrastructure Library (ITIL). 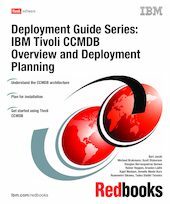 A companion book, IBM Tivoli CCMDB Solution Design Guide, SG24-7567, provides more advanced details about the underlying components of the product and utilizing the product to support robust IT processes, such as Change and Configuration Management. The companion book focuses on the details of the data model, process engine, and the Change and Configuration Management Process Management Programs (PMPs). It provides details on how these can be extended and customized to meet client requirements.